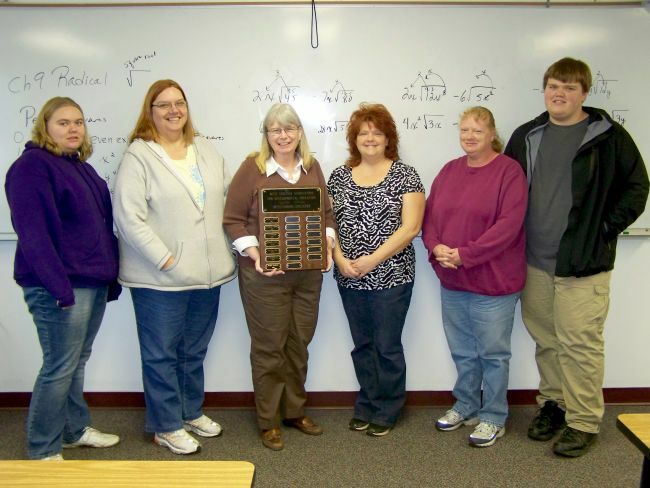 Mary Marlin, third from left, holds the plaque she received for being named the West Virginia Developmental Educator of the Year for 2011. The Shadyside resident is standing with some of her students on the New Martinsville campus of West Virginia Northern Community College. They are, from left, Amber Wilkerson, Pat Roper, Tammy Evans, Donna Mayne and Abe Frohapfel. 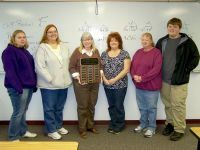 A math instructor at West Virginia Northern Community College, Mary Marlin of Shadyside, has been named West Virginia Developmental Educator of the Year. Marlin, instructor of developmental mathematics at Northern, has been teaching full-time at the college for eight years and has taught developmental math for a total of 18 years at different institutions. The top state developmental educator for the year is announced at the joint conference of the West Virginia Association of Developmental Education and the West Virginia Community College Association. This year’s conference was held the last long weekend of October at Glade Springs Resort, Daniels, W.Va.
Marlin has participated in several continuing education programs related to developmental education, including course redesign programs in Cleveland, Orlando and Chattanooga. She also has participated in a Team-Up Developmental Education program. College officials pointed out that Marlin initiated and taught Northern’s first accelerated developmental classes in math. These classes were taught consecutively in one semester, reducing the time students spend in developmental math courses by one full semester. In addition, Marlin successfully piloted an intersession class, an intensive developmental math class of 40 hours during one week, which also saved students a semester of class time. Marlin designed and conducted Northern’s first ever math boot camp, according to college officials. She also was instrumental in spearheading an ongoing dialogue with area school system personnel, looking at how to work together to identify and solve the problem of underprepared students who enroll in college from high school.